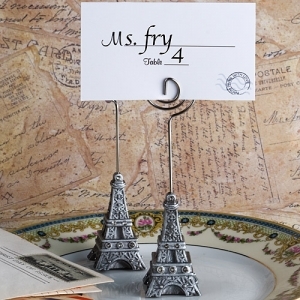 Celebrate Amour with these From Paris with Love Collection Eiffel Tower place card holder favorsYour guests will feel like they stepped right into the center of Paris when they arrive and find their seating assignments chicly displayed in these Eiffel Tower place card holders. Part of Fashioncraft's exclusive From Paris with Love Collection of favors with French flair, each measures 4.5" tall x 1" wide and features a detailed pewter colored poly resin Eiffel Tower replica, enhanced with glistening rhinestones, topped with a silver metal coiled wire designed to hold the event day place card or a photo/note. Sure to up the romance in the room, these Eiffel Tower favors come bulk packed in a poly bag with "From Paris with Love" themed, postage stamp design blank place cards included.